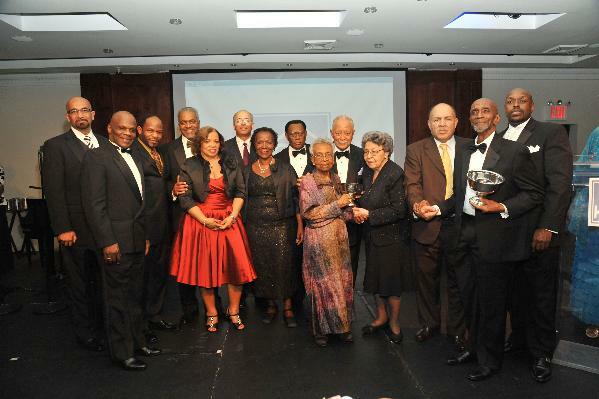 *The Honorable David N. Dinkins, the first African American to hold the office of Mayor of New York City, deservingly received the coveted Canon Frederick Boyd Williams (CFBW) Community Service Award at the Harlem Congregations for Community Improvement, Inc. (HCCI) 25h anniversary “Let Us Break Bread Together” awards gala Thursday, April 14, 2011 at Panache Supper Club in Harlem. 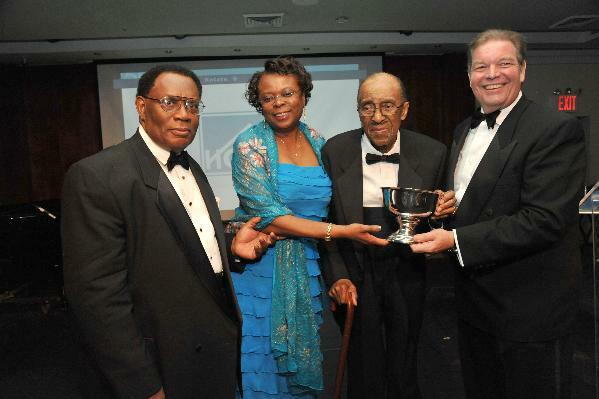 Former New York City Comptroller William “Bill” Thompson presented the award to Dinkins. This marked the second year in a row that the non-profit organization hosted its stellar signature event uptown in the community they serve, the Village of Harlem, further affirming its commitment to developing the Harlem economy. Hosted by Rev. Walter C. Barton, Jr., the dinner also honored: Bruce S. Dale, senior vice president, Community Preservation Corporation; James Allen founder of Addicts Rehabilitation Center (ARC); Rev. Dr. William James, Pastor Emeritus, Metropolitan United Methodist Church and chair of Housing Urban Development Corporation; and Stephanie B. Weldon, local business woman and board member, Greenhope Services for Women. Ronald Wright Norman received HCCI’s fourth annual CFBW Scholarship award established through an endowment by the Rockefeller Foundation. A resident of HCCI’s housing for youth who have aged out of foster care, Norman secured a full scholarship to Syracuse University from JP Morgan Chase with assistance from HCCI. The $1000 CFBW scholarship will assist him with books and incidentals during his first year. “For 25 years, HCCI has to rebuild the Harlem community and to transform the lives of its residents. Tonight we celebrate the resilience of this community and the future of an institution which has dedicated itself to building maintaining this neighborhood’s great legacy,” commented HCCI’s President Lucille McEwen, Esq. during her welcoming remarks. Proceeds from this event will benefit the ongoing work of HCCI, a diverse, interfaith consortium of more than 90 congregations established to revitalize the physical, economic, cultural, and spiritual conditions of the Harlem community. Guests enjoyed an elegant evening of dinner, dancing and entertainment; and departed with marvelous memories topped off with great gift bags.